Home Materials include: a family guide, 2 home long-play CDs, 2 Home Literature Books, 2 double egg shaker instruments, a kangaroo hand puppet with joey finger puppet, and a Domino Game with instructions. Description: Our Kind of Day is designed to apply musical and developmental learning in a multi-age family-themed environment. Through music, movement, ASL, finger plays, story time, instrument and parachute play, Family Time helps children develop musical skills, as well as the social skills necessary to share, take turns, and strengthen the emotional bond among family members. A weekly email helps reinforce learning tips provided by our child development experts in class! 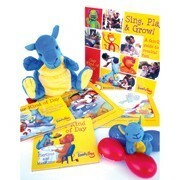 Materials include: a family guide, 2 home long-play CDs, 2 Home Literature Books, 2 double egg shaker instruments, a kangaroo hand puppet with joey finger puppet, and a Domino Game. To Register: Call (703) 228-4747 or call (571) 643-1002 to discuss which class best for your child! Materials include: Specially designed to fit the varying ages and learning abilities of the families in your multi-child classroom, this take-home set reinforces the learning concepts, stories, and songs from class. 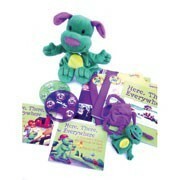 Each set includes one hand and finger puppet; Two literature books: Flip-Flap, Sugar Snap and Jingle-Jangle Jambourine; 42-page activity book; Game board; 2 CDs; 2 Jambourine instruments. Ages: Birth – 5 (Parent-Child) Siblings under 6 months and over 5 are free with registered sibling. Here, There, and Everywhere is designed to apply musical and developmentally appropriate learning in a multi-age, multi-child, family environment. Family Time helps children develop musical skills, as well as the social skills, necessary to share, take turns, and strengthen the family bond among family members. Together we will go on musical adventures to visit a friend, stroll in the park, take a trip to the city, a day at the farm, and spend an afternoon at the aquarium! Children 6 months and younger and siblings over 5 are FREE and welcome with a registered sibling. Please bring your check to the first class for $69 per family for: one hand and finger puppet; 2 literature books: Flip-Flap, Sugar Snap and Jingle-Jangle Jambourines; Activity book; Game board; 2 CDs, and 2 Jambourine instruments.